I arrived at the office just before 9am. My new boss, Rob, ushered me to a small office. He plunked down a big stack of Washington, DC real estate reports. “I’m kind of busy this morning. Why don’t you read these to familiarize yourself with the DC real estate markets,” he said. “I’ll check in on you later.” Then he vanished. I went through the stack. Reading those things one after another felt like chewing cardboard. I saw other people walk past my new office, but they either didn’t see me or ignored me. Eventually lunchtime rolled around and still no sign of Rob. I wandered out of the office, found something to eat, then wandered back to my cardboard reports. Eventually Rob found his way back. He explained what he was working on and gave me some things to do. But it was too late. Make your employee’s first day special. Tell the receptionist to expect them and greet them by name. Have their desk, computer and office supplies all set. A great touch is to tie some welcome balloons to their chair. 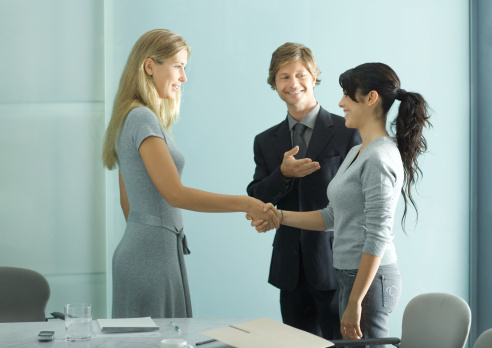 Have their manager meet them immediately and give a tour of the office, with introductions. This one is great. The manager should bring the new employee around the office and use what I call the “accomplishment introduction.” Whenever you meet someone you say “Hi Joe, Chris is the guy I was telling you about. He has great experience with X and he’ll really help us with Y! ” Make your new person feel good and important (because they are). Bring them out to lunch. Nothing is better to break the ice than to break bread with new colleagues. Everyone who attends should have been briefed on the awesomeness of the new person so they can say things like “I heard that you used to do X.” It makes the new person feel valued and important. It’s always good to have a friendly peer to ask questions and get advice about a new workplace. Have one of you staff volunteer to be a buddy for the new person for the first few weeks. I’m sure you can think of more. It’s easy to do. The return on investment is 1,000%, guaranteed. Just focus on making your new guy (or gal) feel welcome, excited and valued. They should walk out the door the first day thinking “This place is awesome!” And you’re one step closer to an incredible culture where people love to work. What does it mean:”Nothing is better to break the ice than to break bread with new colleagues.” I understand that is make current staffs and new staff closer, but not really understand exactly what do you mean. Please, explain for me. Thanks. Hi Hang – I used 2 idioms here. “Break the ice” means to start a conversation with a new acquaintance. “Break bread” means to share a meal with someone. I mean here that a great way to begin building a relationship is to eat together. I have took a new job. Do you have any tips for new employee? (I work at Recruitment Consultant in HR company). Thank you! Yes. Ask your boss “How can I help you to get promoted?” Then do it. I guarantee it will be the first time anyone on her team asked her that. Next: Jeff Bezos Wisdom: What Will NOT Change In Your Business?